Kiefer Sutherland plays a mad psychiatrist in the visually stunning "Dark City"
If there’s one good thing that I can say about Dark City, it’s that it has some of the best visual effects I’ve ever seen. The editing is utterly phenomenal, the direction is stunning and well-paced, and the film as a whole is just decidedly well-made. For the eyes, it’s an absolute pleasure to watch. For the ears, eh… Not so much. The film opens with an introduction from mad scientist Dr. Daniel Schreber, played with utmost lunacy by actor Kiefer Sutherland. He describes the world we are about to see and what goes on in said word. Then we move on to the dimly-lit bathroom of a ominous hotel. A naked bulb swings from the ceiling. A man (Rufus Sewell) awakens in a bathtub, naked as well. He doesn’t know who he is, why here’s here or what he’s doing. Immediately, he receives a call from Dr. Schreber informing him that a group of men, known as “Strangers”, are after him. Schreber also informs him that he is John Murdoch, and is wanted for the murder of several women. After a close encounter with danger, he escapes the hotel, trying to find the meaning behind many things. Like why he remembers so fondly this place called Shell Beach. Like why he has psychokinetic powers that resemble those of the men that are after him. Like why he is wanted for murder, although he can’t ever remember killing anyone. Already, you get the general jist of Dark City. It’s one of those amnesia-related thrillers that hit the cinema every so often. It’s undoubtedly one of the best-looking films out there, but what it lacks is substance. First off, most of the scenes involving the “Strangers” are ludicrous. At the beginning of Dark City, we’re expecting something totally different than what it becomes. Proyas sets us up to believe we’re gonna be watching a handsomely-made noir. That’s not at all what we get. Instead, we get huge cult-like gatherings that take place underground between alien parties. We get a fight sequence that resembles something out of a “Dragonball Z” cartoon. People get sucked into space. A predictable and cliched ending. Alright, so a little ridiculousness I can handle. But Dark City goes out of the realm of ridiculousness, past the gates of far-fetched, and becomes just stupid. With twenty minutes left to go in the film, I said “Enough!” How can something start off so good and end so bad? And sure, maybe this is the kind of film that Proyas intended to create. In fact, I’m sure he did. But it’s not the kind of film I intend to like. There’s only one thing that can save Dark City from being bad and that is just the general look of it. Like I stated before, the visuals are magnificent. The production design is wonderfully reminiscent of classic film noir. Dark City seems to take place in the future, but the design scheme suggests otherwise. Part of me wants to like Dark City; the other part wants to hate it. I think that it’s a good film, but everything just unravels in the most absurd way. I suspect that most fans of science-fiction will be astounded by the brilliance presented in Dark City. 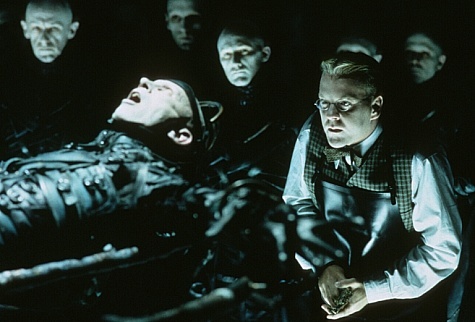 Science-fiction can be done right, but Dark City just isn’t my kind of film. It’s just completely unbelievable and in the end, fairly unoriginal.